Here is my first attempt at a recycled t-shirt yarn hat. I did a little trial and error to get the hat so it fit comfortably on my head. Here is the finished hat that I crocheted from recycled t-shirt yarn. Here is a photo of the hat taken flat. It’s a comfortable bucket type hat that could be worn to keep the sun off your head and face while fishing, in the garden or at the beach. 2) T-shirts cut into 3/8 inch wide strips and gently pulled to curl the t-yarn or tarn in two colors if doing the 2-color hat as shown. Click here for my T-Shirt Yarn making tutorial for recycling old shirts into T-yarn. Do not turn your work in this project. This project is worked in rounds without joining unless advised to do so. Use stitch markers to mark rounds. 23 inch head cir at this point. Adjust if needed for larger hat size at this point. Work Sc in each st around to the last two sts. Sl St into each of the last two sts for a smooth finish. FO with first color if doing a two color hat. Ch 1, Sc in ea st around. Join with Sl St into beg Ch-1. Ch 3, Dc in same st, Skip next st, *Dc, Ch 1, Dc in next st, Sk next st.* Repeat around and join with Sl St to top of Ch-3. Sl St to next Ch-1 space between V-stitch, work 3 Dc in space. 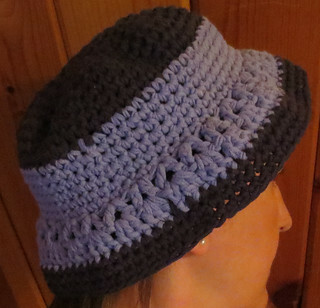 Now just work 3 Dc in each Ch-1 space between V-stitches around complete hat. No need to chain between Dc’s just work 3 Dc’s in each space. FO with light blue t-yarn. Attach dark blue t-yarn and Ch 1 and Sc around in each st. Join with Sl St to beg Ch-1. FO and weave under ends. I am really happy that your are guiding people on how to recycle, that too in a stylish way. You are motivating people to go green. I also do so. I operate an Organic Food Store in India. Thats great! It reminds me of someone who used old fishing line washed up on a beach to create a hat like that. Great for the enviroment! 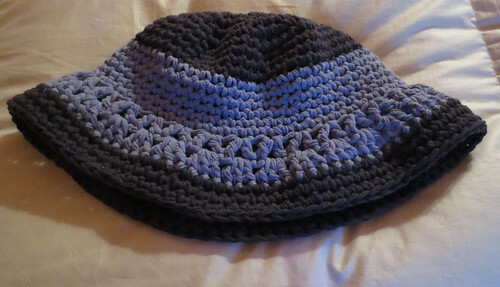 What a beautiful recycled hat! I wish I can make something like this.